Warning: Dont Make a Decision on Whether or Not to Have Lasik Eye Surgery Until You Read This Page! Have you ever dreamed about being able to do any of the following? If so, then this may very well be the most important letter you ever read! There is a new ebook available that reveals everything you need to know about Lasik Eye Surgery to determine whether or not undergoing this popular procedure is right for you. * The history of Lasik Eye Surgery you will discover who developed it, who refined it and the role wavefront technology is playing in making it more accurate than ever before! * Ten questions to ask your doctor before you have the procedure your eyes are vital to everyday life asking these 10 questions will help ensure you have all the information you need to make a good, safe decision for yourself! * How to choose the right surgeon put your mind at ease follow these tips to ensure you select the best candidate! * 7 eye conditions that Lasik can help correct Lasik is not just for improving vision find out what else it can help you with here! * The 3 types of Lasik candidates and how to tell which one you are! * 7 factors that determine whether you are a good candidate for Lasik you may be very surprised at what you read here! * The types of lasers used for Lasik Eye Surgery and how to know which one is best for your procedure! 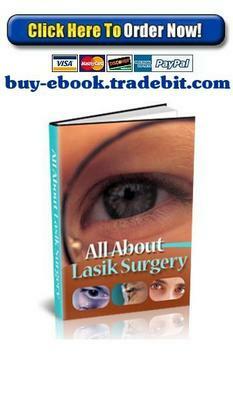 * What to expect immediately after surgery plus, the long term affects of Lasik! If you are tired of your glasses or contact lenses and the hassles that go with them, then Lasik is definitely something worth looking into. Many people have been able to achieve 20/20 vision or at least lower their prescription if their vision is particularly bad. But it is very important for you to understand what you are getting into with any type of procedure and, as with all surgeries, there is always potential for complications. Before going under the laser, you will want to do your research on the procedure and thats where this eBook comes into play. All About Lasik Eye Surgery covers everything that you need to know and do before you go in for surgery. Thats Why I Believe This Information is Really Priceless! But because I have to put a price on this ebook, I am going to say that right now you can get all of this important information on Lasik eye surgery for the low introductory price of just $1.99!